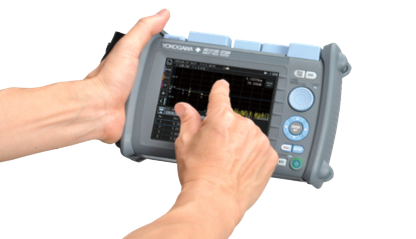 The Yokogawa AQ1210 series OTDR is designed to empower field technicians to make fast and precise measurements with confidence. The AQ1210 OTDR delivers high reliability with its robust design for operating under harsh field conditions. Engineered with innovative technology, the AQ1210 features dual operation mode by multi-touch touchscreen and hard-key buttons as well as fully automatic measurement and easy-to-read analysis reports through new software applications. In addition, the AQ1210 enhances productivity and operability with its lightning startup time, multi-tasking operation, and immediate reporting via wireless connectivity. *USB power adapter (Type-C) is required for battery charging (sold separately). The AQ1210 features a capacitive multi-touch touchscreen, 5.7-inch LCD, and a “field use” friendly rotary dial. Remote access is possible via Wi-Fi or ETHERNET connection. Tap, swipe, pinch or press. Choose between the high resolution 5.7-inch multi-touch capacitive touchscreen or the robust hard-key buttons in any combination desired. 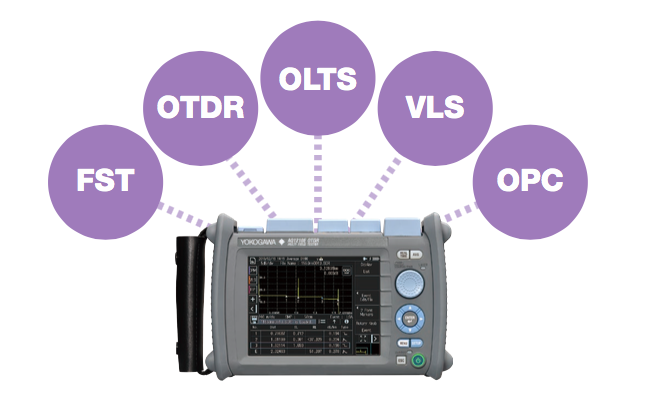 OTDR operations have never been easier! No worrying about running out of battery power during your daily work. The AQ1210’s high capacity Li-Ion polymer battery will last for 10 hours under the Telcordia standard conditions. From completely OFF to measurement ready in under 10 seconds! 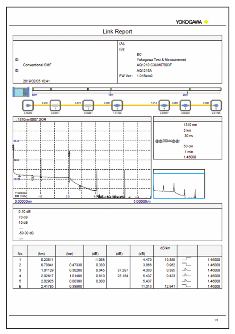 Easily toggled trace view for manual supplementary analysis. Managed by a highly efficient operating system, multiple functions can be performed simultaneously. 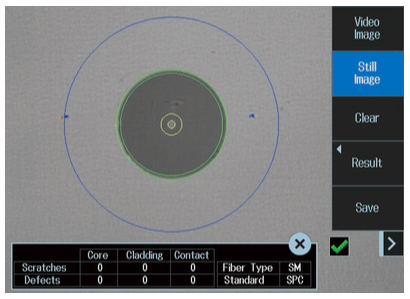 Now, users can perform OTDR measurements on a particular fiber core while simultaneously checking the power level, connector surface quality and visible fiber ID/bending on three other fibers. When detecting/identifying the position of a fiber end point or bend of an installed optical fiber network, a user, according to the operating environment, can choose among the two modes: the high-speed mode with less measuring time and the high accuracy mode that is capable of reproducing a high-quality waveform. OTDR-based application in a database view. Guiding users in tracking multi fibers measurements in sequence. OTDR trace, power level and connector surface image of a particular fiber core are organized as one group. With PASS/FAIL judgment, fiber core performance is easily characterized. 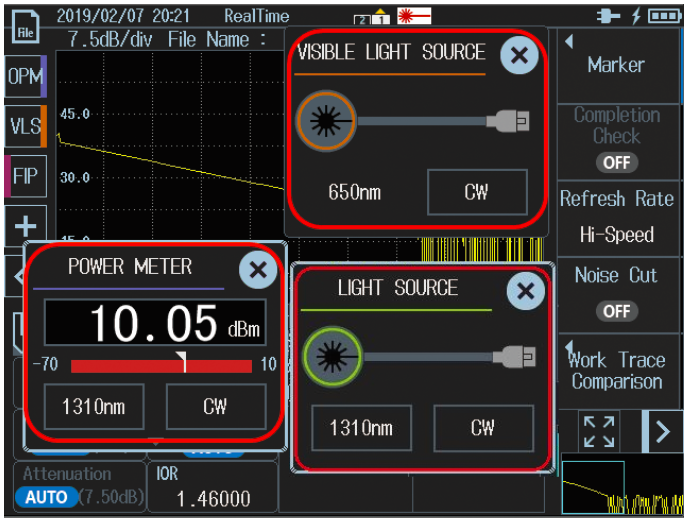 Built-in post-processing software for generating OTDR reports in PDF format. Flexible configuration of report template to meet users’ report requirements. 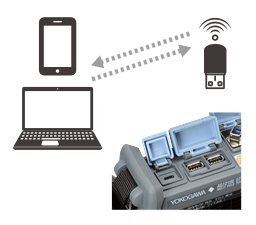 The AQ1210’s data files can be transferred to a smartphone or tablet through Wi-Fi using a web browser or the OTDR data transporter, or a WindowsTM PC through Wi-Fi or LAN using a web browser or the AQ7933 Emulation software. The AQ1210 can be controlled remotely by a smartphone or tablet using a web browser and by a WindowsTM PC using a web browser, the AQ7933 Emulation software, or remote- control commands through Wi-Fi or LAN. Using a video fiber inspection probe*, fiber connector surface is visualized for inspection of scratches and dirt. The Fiber Surface Test function (option) can automatically analyze scratches and dirt and makes PASS/FAIL judgment based on IEC61300-3-35 compatible or arbitrary decision criteria. 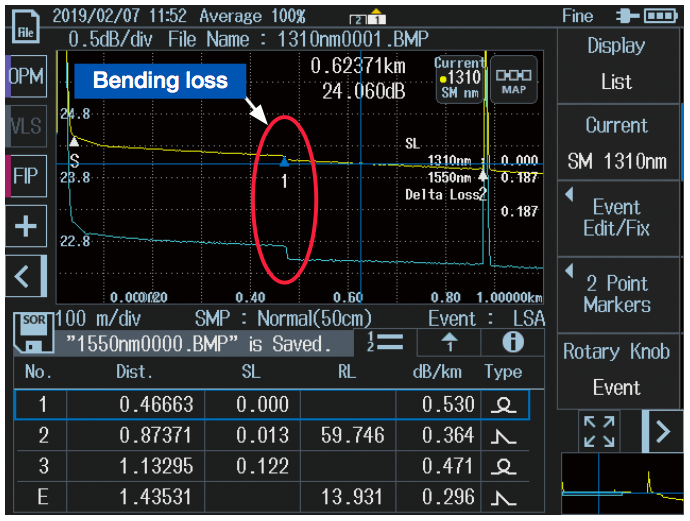 Macro bending events along a fiber under test can be identified and located automatically by OTDR measurements using multiple wavelengths trace comparison and event analysis based on user-defined thresholds. 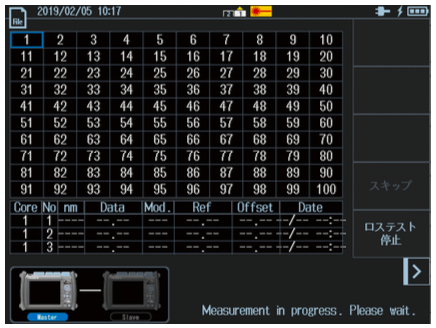 Up to four traces can be overlaid on the display for analysis and comparison. This is useful for evaluating the locations and loss of connections after installing multiple fibers. Averages the two traces measured from one end of fiber link and the other to nd the connection loss properly and accurately. When only measured from one end, the connection loss may be shown incorrectly due to the difference in the backscatter coefficient between the connected fibers. Displays the difference between two specified traces. Makes it simple to check aging of fibers or connection points, or variation in loss among fibers, and other phenomena. 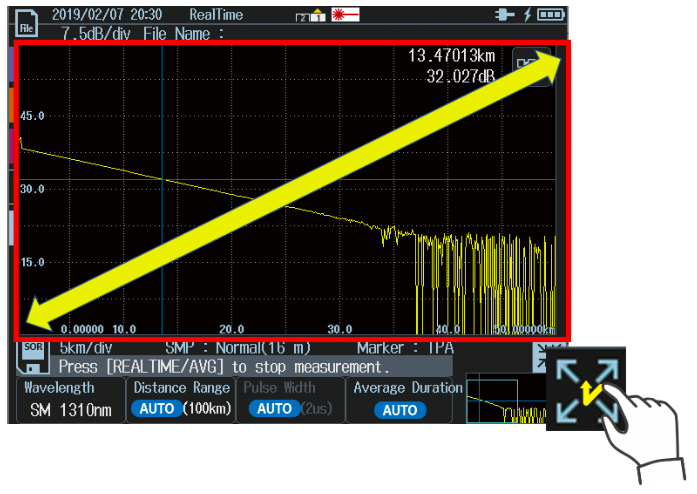 Finds the total return loss in specific section of fiber link. It is often required because the multiple reflections from optical fiber networks can affect the optical communication signal from transmitters of CATV for instance. 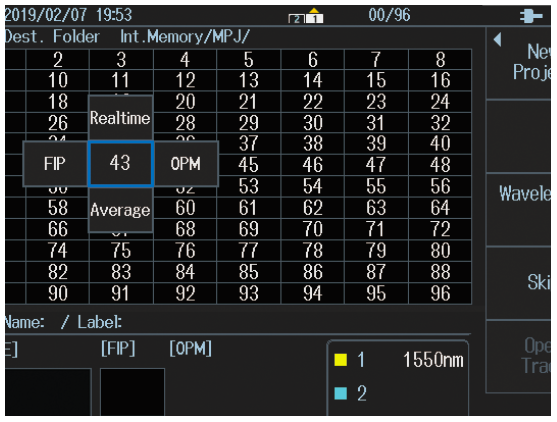 The OTDR view can be switched between the trace and the map by simply tapping the icon. 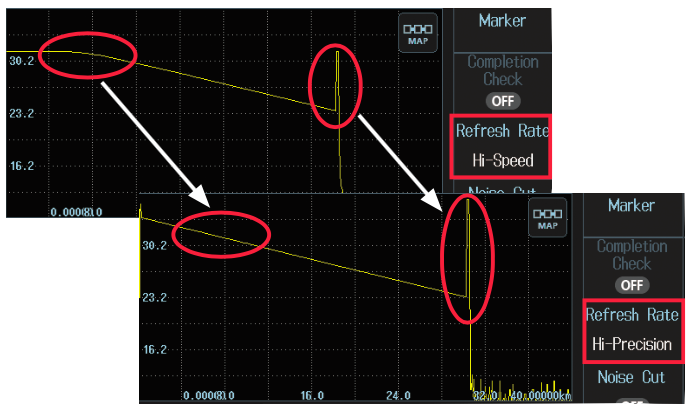 The trace is a traditional view with an OTDR waveform and event markers, and the map is an icon-based view for easy interpretation of network events, which is also used for the Smart mapper function. By simply tapping the dedicated icon, the trace display window can be enlarged for easy viewing and manipulation. 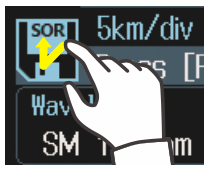 Simply pressing “Direct save” icon, measured data can be saved in SOR, PDF, or both formats according to users’ prior selection. Optical loss test is performed by adjusting the optical output power (P1) at the end of launch fiber and measuring the output power of fiber under test (P2) afterward. */SPM or /HPM option is required. The high power optical power meter (/HPM option) can measure the high optical power up to +27 dBm. It allows to measure video services and long distance transmission lines where an optical amplifier is used to boost the optical signal power. The Multi-fiber loss test function incorporates two AQ1210s as master and slave through the communication fiber in the cable under test. They share a test project information including fiber numbers to be tested and measurement conditions, so that you can ensure the measurement is performed properly for each fiber of the cable under test. */SPM or /HPM option is required. The PON power meter can measure the optical power both at 1490 nm and at 1550 nm simultaneously by separating those wavelengths. 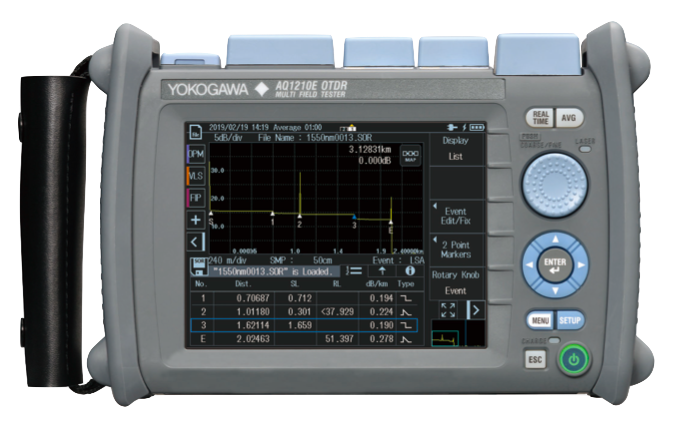 It is a suitable tool for measuring the optical power of OLT and V-OLT.